It's been a crazy day of new Apple product launches, chief among them a batch of flagship iPhones ready for the end of 2017. If you're not tempted by the smaller iPhone 8, perhaps the iPhone 8 Plus will be the model most suited to you - here's what you need to know. To help you decide we're going to put the new phone up against the Galaxy Note 8 and the LG V30, two of the best handsets from rival manufacturers released so far this year. We'll compare these phones in terms of design, performance, camera quality, price, and more. It's getting harder and harder to find an ugly phone out there and while the iPhone 8 Plus (above) doesn't depart too far from last year's iPhone template, it's still got curves and glass in all the right places. The bright, Retina HD 5.5-inch screen is backed with the usual aluminium enclosure, and it looks a lot like the iPhone 7 Plus - which is no bad thing. We reckon the Samsung Note 8 pips it in terms of design though, with a spectacularly fine 6.3-inch AMOLED Infinity Display screen, packing in 1440 x 2960 pixels and a stretched aspect ratio of 18.5:9. As with Samsung's other flagships this year, the bezels are pretty much non-existent, leaving a phone that really looks the business (from the front at least). LG also goes for the stretched, minimal bezel look, following the LG G6 with a similar screen on the LG V30, although this time it's extended to 6 inches. Under the POLED touchscreen there are 1440 x 2880 pixels, and in terms of its overall design it's hard to fault the V30 - we reckon it's about neck-and-neck between the Samsung and LG phones here. As usual Apple has given its iPhones a specs bump to make the new range of models, and hidden away inside the iPhone 8 Plus you're going to find a six-core A11 Bionic chip that promises the best performance yet from an Apple handset. Apple usually keeps the exact specs of its phones carefully under wraps, but we know that this is one speedy handset. Both the Note 8 (above) and the LG V30 are powered by the Snapdragon 835 processor, though in some regions Samsung uses its own-brand Exynos 8895 equivalent. Elsewhere on the Note 8 you get 6GB of RAM and a choice of 64GB, 128GB, and 256GB of internal storage. As usual with Samsung, you can expand that with a microSD card if you need some extra space. As well as the Snapdragon 835 processor we've mentioned, the LG V30 comes rocking 4GB of RAM and 64GB of internal storage - that goes up to 128GB with the LG V30+ model and again you can expand that with a microSD card. In terms of raw power there's not much to choose between these phones - we'll really need to see some real-world benchmarks. Two of the most important components in a smartphone, and the iPhone 8 Plus comes with a dual-lens camera with two 12MP lenses that Apple says are better than ever and is configured to show off all the augmented reality ARKit apps that are coming soon. As for the battery size, we'll have to wait for a full breakdown of the new iPhones to tell you. Over in the Samsung corner you've got a dual 12MP camera with optical image stabilisation and 2x optical zoom should you need it, as well as support for 4K video recording. By all accounts it's a fantastic camera and keeps up Samsung's excellent reputation for decent low light performance. You also get a 3,300mAh battery inside. LG has been keen to talk up the f/1.6 aperture on its LG V30 (above), a new high for a smartphone, which should in theory let in more light than ever. Again it's a dual-lens camera, with 16MP and 13MP sensors combined, with optical image stabilisation and 4K video recording included too. As for the battery it comes with a 3,300mAh pack installed. 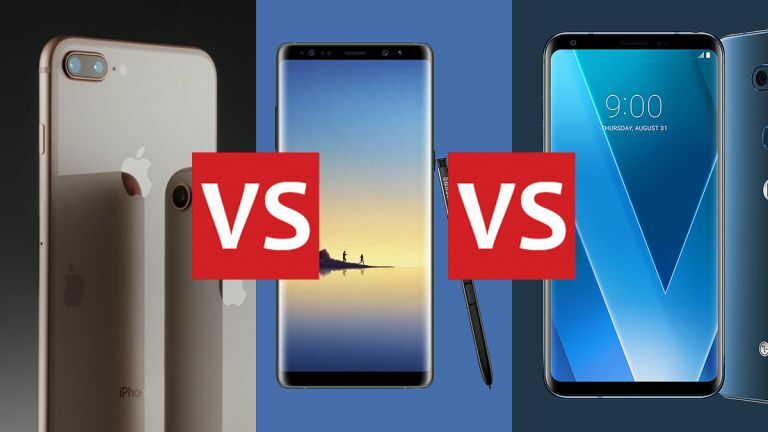 It's not easy choosing between these phones and a big part of your thinking will probably be about the various merits of iOS versus Android. A lot of that is down to personal preference of course, but there isn't too much to choose between them in 2017 - both have all the major apps and both are slick and smooth experiences on these handsets. Fans of elongated, 18:9 displays with very little in the way of bezels are going to gravitate towards the Samsung Note 8 or the LG V30, but the iPhone 8 Plus has its merits too - an upgraded camera, wireless charging, an all-glass chassis, iOS 11, and all the usual Apple refinements. If you don't care for the Android approach then the iPhone 8 Plus is a great phablet option. We're still waiting for exact pricing details from LG and Apple, though it's likely that both the LG V30 and the iPhone 8 Plus will cost slightly less than the £869 or $930 you need to pay for a Note 8 outright at the moment. That said, the Samsung handset is the only one supplied with its own smart stylus, so you might consider the extra outlay worth it.